What is the "Chair of St. Peter"? What is the "Chair of St. Peter"? Here are nine answers to that question. 1. What is the Chair of Peter? It depends on what you mean. On the one hand, there is a physical object--an ancient, ornamented chair--located in the apse of St. Peter's Basilica. On the other hand, there is the spiritual authority that this chair represents. Here we will look at both the physical object and the spiritual reality it represents. 2. What is the physical Chair of St. Peter? 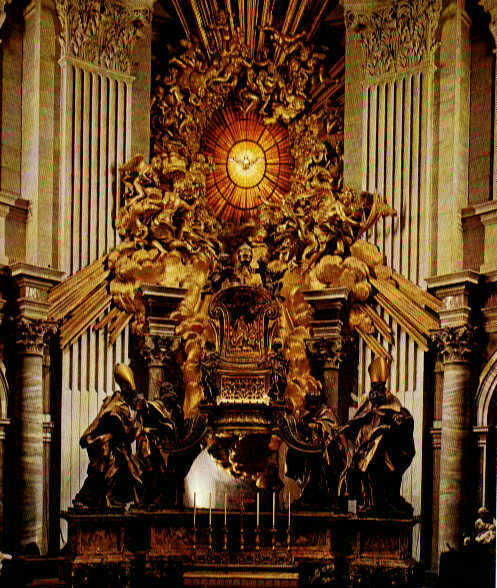 This object--known as the Cathedra Petri (Latin, "Chair of Peter")--is located in the apse of St. Peter's Basilica. It is in the back of the chamber, behind the famous altar, on the far, back wall, below the well-known, stained glass image depicting the Holy Spirit as a dove. This display contains an ancient chair that has been repaired and ornamented over time. The Catholic Encyclopedia states of the original chair: The seat is about one foot ten inches above the ground, and two feet eleven and seven-eighths inches wide; the sides are two feet one and one-half inches deep; the height of the back up to the tympanum is three feet five and one-third inches; the entire height of the chair is four feet seven and one-eighth inches. According to the examination then made by Padre Garucci and Giovanni Battista de Rossi, the oldest portion is a perfectly plain oaken arm-chair with four legs connected by cross-bars. The wood is much worm-eaten, and pieces have been cut from various spots at different times, evidently for relics. To the right and left of the seat are four strong iron rings, intended for carrying-poles, which are set into the legs. 3. How has the chair changed over time? Various modifications have been made to the chair, to repair and ornament it. Most notably, the famous Italian artist/architect Bernini (1598-1680) created the current display. The Catholic Encyclopedia notes: During the Middle Ages it was customary to exhibit [the chair] yearly to the faithful; the newly-elected pope was also solemnly enthroned on this venerable chair. . . . In order to preserve for posterity this precious relic, Alexander VII (1655-67) enclosed, after the designs of Bernini, the Cathedra Petri above the apsidal altar of St. Peter's in a gigantic casing of bronze, supported by four Doctors of the Church (Ambrose, Augustine, Athanasius, Chrysostom). 4. Did St. Peter really sit in this chair? In the early 20th century, the Catholic Encyclopedia stated: We conclude, therefore, that there is no reason for doubting the genuineness of the relic preserved at the Vatican, and known as the Cathedra Petri. However, since that time the fields of history and archaeology have advanced considerably, and, when Pope Benedict addressed the subject in 2006 and 2012, he spoke in a more reserved way, saying: Dear brothers and sisters, in the apse of St Peter's Basilica, as you know, is the monument to the Chair of the Apostle, a mature work of Bernini. It is in the form of a great bronze throne supported by the statues of four Doctors of the Church: two from the West, St Augustine and St Ambrose, and two from the East: St John Chrysostom and St Athanasius [General Audience, Feb. 22, 2006]. The Chair of St Peter, represented in the apse of the Vatican Basilica is a monumental sculpture by Bernini. It is a symbol of the special mission of Peter and his Successors to tend Christ’s flock, keeping it united in faith and in charity [Angelus, Feb. 19, 2012]. He thus placed less emphasis on the archaeological authenticity of the chair than on its spiritual significance. 5. What is the spiritual significance of the feast the Church celebrates on February 22?According to Pope Benedict, "This is a very ancient tradition, proven to have existed in Rome since the fourth century. On it we give thanks to God for the mission He entrusted to the Apostle Peter and his Successors. 'Cathedra' literally means the established seat of the Bishop, placed in the mother church of a diocese which for this reason is known as a 'cathedral'; it is the symbol of the Bishop's authority and in particular, of his 'magisterium', that is, the evangelical teaching which, as a successor of the Apostles, he is called to safeguard and to transmit to the Christian Community. . . . The See of Rome, after St. Peter's travels, thus came to be recognized as the See of the Successor of Peter, and its Bishop's 'cathedra' represented the mission entrusted to him by Christ to tend His entire flock..."
Celebrating the "Chair" of Peter, therefore, as we do today, means attributing a strong spiritual significance to it and recognizing it as a privileged sign of the love of God, the eternal Good Shepherd, who wanted to gather His whole Church and lead her on the path of salvation [General Audience, Feb. 22, 2006]. 6. What does the first Scripture reading of the day have to teach us? The first reading for the day is 1 Peter 5:1–4, which reads: So I exhort the elders among you, as a fellow elder and a witness of the sufferings of Christ as well as a partaker in the glory that is to be revealed. Tend the flock of God that is your charge, not by constraint but willingly, not for shameful gain but eagerly, not as domineering over those in your charge but being examples to the flock. And when the chief Shepherd is manifested, you will obtain the unfading crown of glory. This reading introduces the idea of the leaders of God's people as spiritual shepherds, focusing on Christ as the Chief Shepherd. Although Peter is below Christ as His under-shepherd (John 21:15-17), he does not direct attention to himself. Instead, he extends the office of shepherd to the leaders in his audience, revealing to them the way that they are to serve the portions of Christ's flock entrusted to their care--not by lording it over them ("domineering over those in your charge") but by serving in a truly spiritual manner ("being examples to the flock"). The first reading thus serves as instruction in the first place for those who are ordained ministers in Christ's Church but--in an extended way--it serves as instruction for all of us, for we all influence others and should set the same example. 7. What does the responsorial Psalm of the day have to teach us? The responsorial Psalm is taken from Psalm 23:1-6. It also echoes the theme of shepherding. In this case the Lord is identified for the individual believer as "my Shepherd," with the result that "I shall not want" (that is, I shall not lack anything). The whole Psalm thus is taken up into the theme of the day, focusing on the relationship between God as the ultimate shepherd of our souls and we as the individual members of His flock. 8. What does the Gospel reading for the feast have to teach us? The Gospel reading for the feast is Matthew 16:13-19, in which Jesus declares Peter the rock on which He will build His Church. 9. Does the pope have to sit in the physical Chair of Peter to be infallible? No. Although the pope's infallible pronouncements are called ex cathedra (Latin, "from the chair") statements, he does not have to be sitting in the physical chair (which is rather high off the ground in any case). In fact, he doesn't have to be seated at all. He simply has to use the fullness of his authority as the successor of Peter to definitively teach a particular matter pertaining to faith or morals. This use of the full extent of his teaching authority is referred to figuratively, as him speaking "from the chair" of St. Peter. It's a figurative expression, not a reference to the physical object.